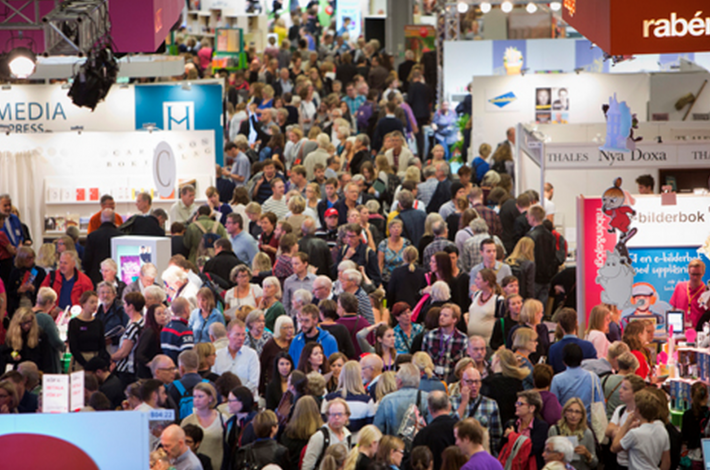 The International Rights Center at Sweden’s Göteborg Book Fair late last month had a record number of businesses represented: 62 in total, of which six were agents and publishers from Canada (a first). One market focus country this year was Hungary, which stole the headlines less for its literature and more for its controversial politics, overshadowing the Voices from Iceland program. Looking beyond Swedish crime, a fantastical trend is on the horizon. In a seminar on children’s and YA literature, literary academic Per Israelson stated that sci-fi and horror were definitely gaining ground and about half of all Swedish titles for young people fall into this category today. Svenska Dagbladet reported that sales of children’s and YA were up 11% on last year. Looking to Frankfurt, here are few notable titles. The Saga of Turid by Elisabeth Östnäs (YA, Hedlund Literary Agency) explores Viking life in a time when society is transitioning from paganism to Christianity. Christin Ljungkvist’s Rabbit Heart (YA, Brandt New Agency) tells the story of twins who have psychic abilities. Ellen Karlsson’s beautiful picture book The Blue Door (Hippo) is a story about a magical portal in a child’s stomach. Jessica Schiefauer’s Girls Lost (YA, Nordin Agency) is a magical coming-of-age tale about gender, identity and violence and the film adaptation premiered at the recent Toronto International Film Festival to rave reviews. Schiefauer’s latest YA novel The Eyes of the Lake tackles the subject of a hate crime that rocks a group of teenagers and the entire country of Sweden; it won the Swedish Institute for Children’s Books annual prize for best crime novel for young readers. Also tackling neo-nazism is My Brother’s Name is Noa (Alfabeta), a children’s book by Anna Clara Tidholm. Sofia Nordin examines the creation of the social contract in her post-apocalyptic tale As If I Were Fantastic (YA, Nordin). For adult readers, Bonniers Rights represents Kristina Hård’s Kleptomania, a trilogy-in-progress that delves into Swedish folklore, mythical creatures, and a mystery surrounding a great fortune and a man who revolutionized air travel (In this world, we travel by airship). Åsa Ericsdotter’s The Epidemic (Brandt New Agency) is an allegorical tale about the rise of right-wing extremism in Europe, focusing how a nation in turmoil tackles epidemic obesity. A literary novel that touches on horror and dystopia, Aris Fioretos’s Mary (Hedlund Literary Agency) is a chilling tale of political violence, pregnancy and a military prison on an island. On the literary front, publishers might want to take a closer look at strong female voices from Sweden. English-speaking readers have had the chance to discover Lena Andersson (Partners in Stories, the novel Arbitrary Conduct sold to 20 countries) and Katrine Marcal (Kontext Agency, her nonfiction takedown of 200 years of economics sold to 12 countries and counting), and we’ll soon be introduced to exceptional talents including Lina Wolff (out with And Other Stories in the UK and North America next January), Sara Stridsberg (Hedlund Literary Agency, Beckomberga has been sold to 12 countries, including the UK ), and Karolina Ramqvist (The White City has been sold to eight countries, including Grove Atlantic). Norstedts highlighted Stina Stoor as one of their strongest new voices that they’d be bringing to Frankfurt. Stoor was also featured as part of the Arts Council’s Travel Fellowship program. Kristina Sandberg’s August Prize–winning chronicle of a woman’s life in the twentieth century, The Maj Trilogy (Norstedts), is for publishers looking for a Swedish author to place alongside Ferrante and Knausgaard. Cilla Naumann writes with heartbreaking insight and intelligence in the novel Carry the Child Home (Partners in Stories), which tells the stories of an orphan in Colombia and a Swedish mother who travels with her adopted child back to Colombia to meet his birth mother. For those who were spellbound by the setting of Sara Stridsberg’s The Gravity of Love, Karin Johannisson’s The Wounded Diva (Bonnier Rights) returns the reader to the famous Beckomberga asylum and examines the cases of three female artists, the relationship between madness and creativity, as well as twentieth-century psychiatry. Speaking to publishers and agents, there is a renewed interest among young Swedish (and Finnish) authors in writing about Lapland, a cultural region inhabited by the Sami people that stretches through the Arctic across the north from Norway to Russia. Think epic wilderness, reindeer, colonialism, and uncanny atmospheres akin to David Lynch’s Twin Peaks series. Ida Linde’s You Travel North to Die, Norstedts, is a personal favorite. Po Tidholm’s Norrland, collected reportage on the region from Teg Publishing, is on my must-read list. Visitors to the fair will have found it impossible to miss Jonas Hassan Khemiri, whose literary novel All I Can’t Remember is one of the highlights of the past year. In a documentary style through multiple voices, the novel pieces together the last day of Samuel’s life. It’s Khemiri at his best. The general increase in interest in health and lifestyle in Sweden—from cooking to personal care—was also reflected at the fair with more space than ever dedicated to books and publishers in this category. Everywhere you looked there were books about braiding your hair, making your own mince meat, and self-improvement. One of my favorites has been Stefan Einhorn’s popular science/self-help book The New Seven Deadly Sins (Bonnier Rights). The Bennet Agency is representing several attractive titles, including a book on making your own condiments called Condiments and a number of titles on Swedish crafts (such as sewing children’s clothing). This is the first year I’ve reported on the fair as part of the Swedish Arts Council’s Travel Fellowship. I joined fellow translators from China, the UK, Germany, Italy and beyond as well as publishers from countries including Iceland, Hungary, El Salvador, Armenia, the UK and US for two days of seminars about Swedish literature and publishing, as well as networking. Andres Norman Castro Arevalo from Editorial del Gabo in El Savador and Artur Mesropyan from Armenia’s Zangak Publishing House told me they applied to the travel fellowship in order to learn about the market and to scout titles. Castro Arevalo was looking for contemporary Swedish poets and Mesropyan mentioned that he was looking for books that depicted Swedish life to add to a list that publishes something for everyone—from Dan Brown to Alice Munro. In addition to reminding us all of the many grants available to support the translation and promotion of Swedish literature abroad, our hosts from the Arts Council’s Swedish Literature Exchange Susanne Bergström Larsson and Susanna Höijer helped us make connections within the group and beyond. This well-curated, social experience was an excellent reminder that though the life of a translator demands solitude, none of us are working alone. In 2016, the fair’s main theme will be Freedom of Speech and will run from 22-25 September.